This series of high frequency, short stroke screen decks are ideally suited for classifying fine material, 10 mesh to 325 mesh. 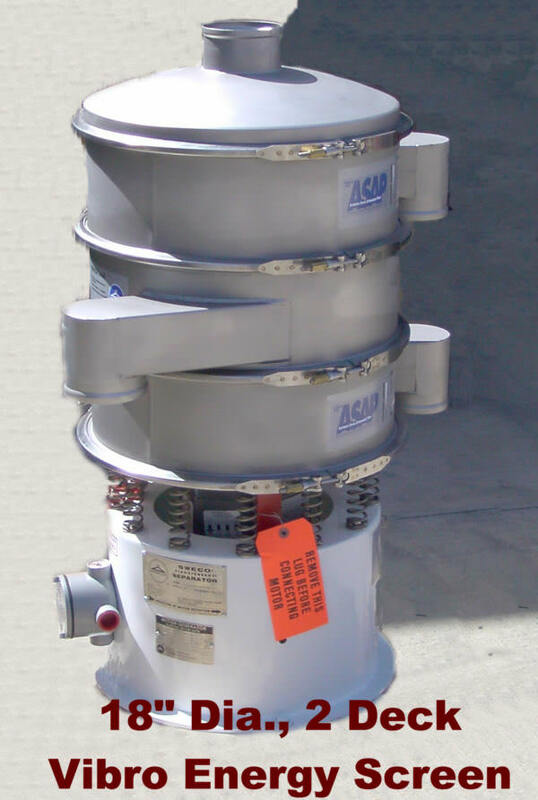 The 18 inch and 24 inch models are used in laboratories for screening large samples, while most of the larger sizes are used in pilot plant applications. The 18 and 24 inch models are available in up to 4 screen decks, while larger sizes are only available in 1, 2 or 3 deck versions. The vibro-energy screens vibrate about its center of mass. 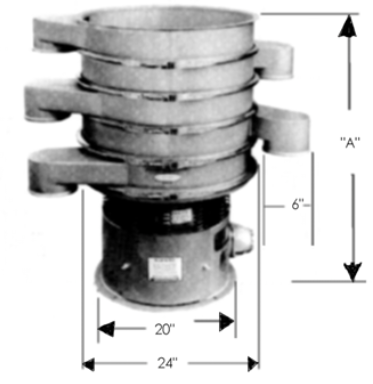 Vibration is accomplished by eccentric weights on the upper and lower ends of the motion-generator shaft. Rotation of the top weight creates vibration in the horizontal plane, which causes the material to move across the screen cloth to the periphery. 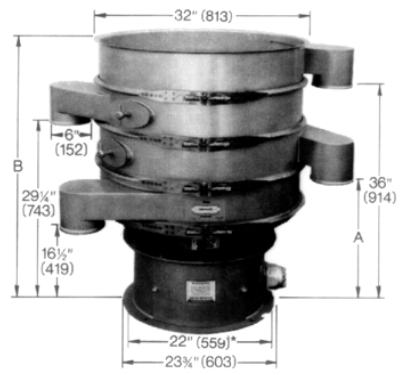 The lower weight acts to tilt the machine, causing vibration in the vertical and tangential planes. The angle of lead given the lower weight with relation to the upper weight provides variable control of the spiral screening pattern. Speed and spiral pattern of material travel over the screen cloth can be set by the operator for maximum throughput and screening efficiency of any screenable product, wet or dry, heavy or light, coarse or fine, hot or cold. 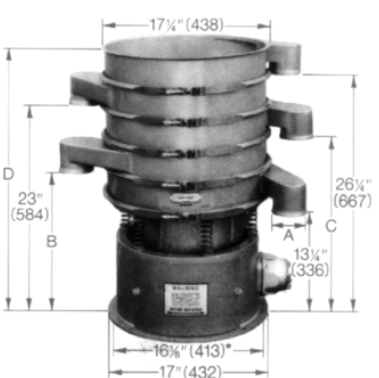 Vibro-energy screens are available in one to four decks, 18 inch diameter through 72 inch diameter models, with electrical requirements ranging from 110V/1 ph (for 18″ & 24″ screens) to 220, 440 V/3 Ph/60 Hz, or 380 V/3 Ph/50 Hz for all models. Since no vibration is transmitted to the floor, no special foundation is required for installation of a vibro-energy screen.